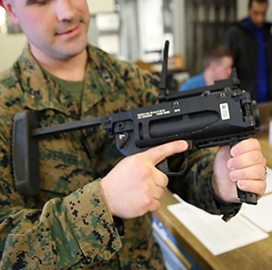 The U.S. Marine Corps intends to implement a new grenade launcher to support long-range and short-range infantry engagements and performed tests to evaluate the weapon's technical characteristics. The M320A1 weapon is geared for standalone and rifle-mounted use during day and night operations, the service branch said Friday. Maintainers, engineers and logisticians tested and analyzed the grenade launcher earlier this month to identify its provisioning, sustainment and training requirements. The first of two evaluation procedures sought to determine whether a component would require replacement or repair. This process, known as the level of repair analysis, helps with data collection for the development of support tools that would address issues with the weapon. The second procedure, known as the job training analysis, developed training instructions on how to properly utilize the weapon during battlefield operations. “We got the system in Marines’ hands, worked out the kinks and began to understand how we’re going to use this moving forward," said Lt. Col. Tim Hough, program manager for infantry weapons in Marine Corps Systems Command’s ground combat element systems.